Chicken is one of the most popular products, it is present in the menu of many people. Meatballs of chicken mince is ideal for those who are watching their diet, because they are more mild than dish of pork or beef meat. This recipe is very simple to cook chicken meatballs for the family dinner. They are baked in the oven. Wash the chicken fillet, slightly to beat off, then slice in small pieces and mix with chopped onions. Skip the mixture through a meat grinder, season with pepper and salt or any other spices to taste. Whisk the egg and mix with minced chicken. Promazhte cream (20 ml) baking pan. Form of minced meat small balls, put in the form. Bake in the oven at 180 degrees for about 15 minutes. While the meatballs baked, it's time to cook the sauce. To do this, RUB the cheese on a grater, chop peeled garlic cloves with chesnokodavilku, mix with cream. 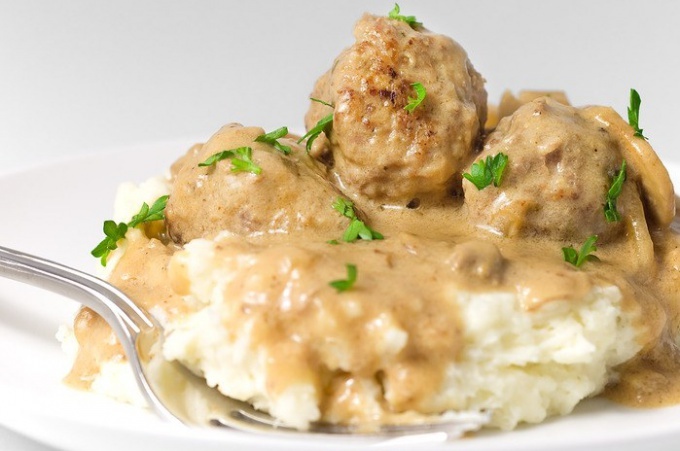 Remove meatballs, pour cream sauce, return them to the oven for 15-20 minutes. Can be served as a separate dish or with any meal. These chicken meatballs are cooking even simpler than the previous recipe, despite the larger number of ingredients. Tomato sauce perfectly complements the meat balls. - grated Parmesan, dried oregano, pepper, salt - to taste. As in the previous recipe, skip the chicken fillet through a meat grinder, only this time not mix with onions and white bread. Mix the minced meat with milk, egg white, cheese, oregano. Add salt and pepper to taste. From stuffing to form balls, fry in olive oil for 5 minutes, then add the mashed tomatoes with juice, cover, cook 15 minutes. Prepared chicken meatballs serve with mashed potatoes or spaghetti. Thanks ground paprika and pepper taste turns spicy meatballs. Soak dry bread in milk, press. Chop the onions and chicken up small, mince together with the tomato ketchup, egg, herbs, paprika and pepper. Salt the meat. RUB the pan with oil. Chicken mass with wet hands, shape meatballs, place on a baking sheet. Bake for 30 minutes at 180 degrees. Serve hot.